Home » Blog » Asia » Thailand » Is This the Most Beautiful Beach in Thailand? Designating something as the “most” or “best” is always tricky. I mean, I haven't BEEN everywhere or SEEN everything, so how can I confirm if I have, in fact, eaten the BEST pizza in Chicago or seen the MOST UNIQUE lighthouse in New England? 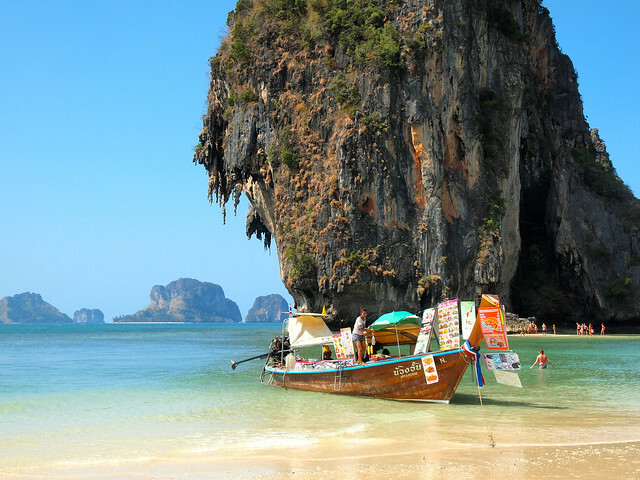 Similarly, how can I confirm or deny that the most beautiful beach in Thailand lies on the Railay peninsula? Well, the truth is that I can't. I haven't been to all of Thailand's beaches. There are so many of them that it would take years, maybe even decades to see them all. And even then my definition of “most beautiful” might be different than yours. 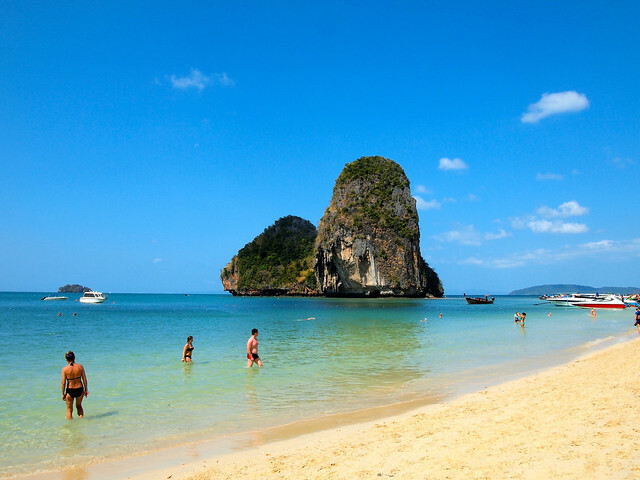 What I CAN do, however, is show you some photos of the beaches that often get these “best” and “most” designations on Thailand's Andaman Coast, and let you draw your own conclusions. Many people think Railay is an island since it and its beaches can only be reached by longtail boat from either Ao Nang or Krabi town. It's actually a peninsula, though. 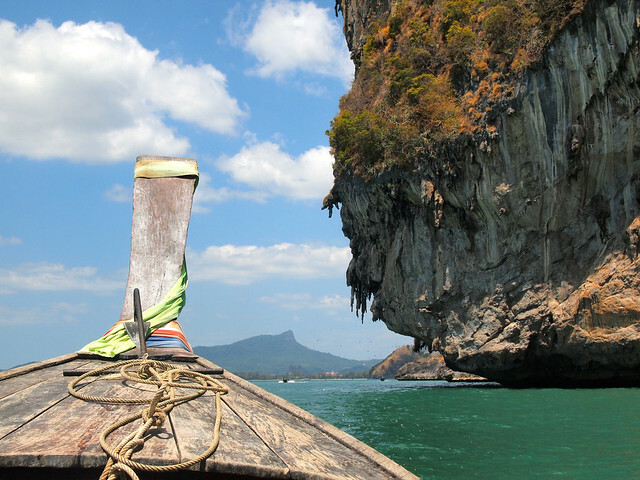 The reason you can only reach it by boat is because of the tall limestone mountains that make the peninsula so famous. 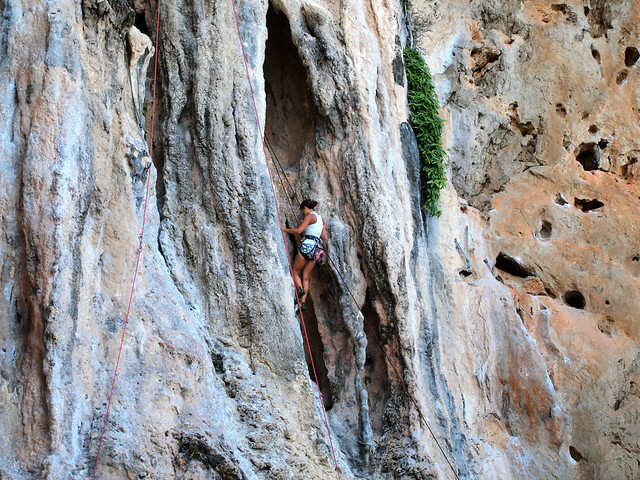 These mountains give Railay its breath-taking scenery — and also make it really popular with rock climbers. If you catch a longtail boat from Ao Nang like I did (150 baht roundtrip, or roughly $4.50 USD), you'll be dropped off on Railay West Beach. This long sweeping beach is usually lined with longtails and can get quite crowded in the afternoons. The limestone cliffs here are really impressive, though, which definitely make it worth seeing. 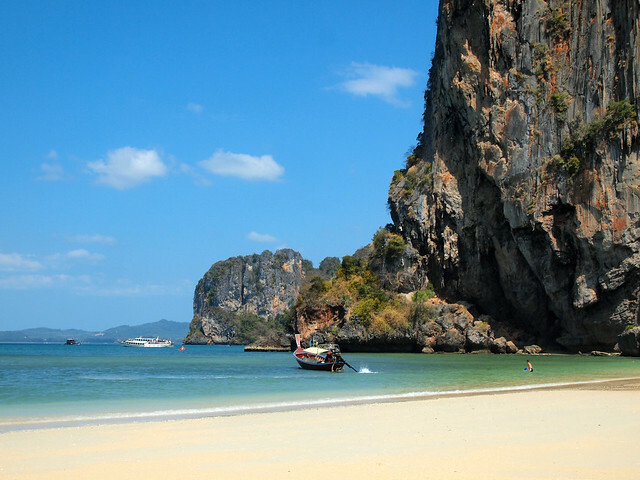 This isn't the “most beautiful beach in Thailand,” however. That designation goes to a beach a little further south along the peninsula. Nope, still not the “most beautiful.” You have to cross over to this side of the peninsula, however, if you want to head further south. This beach isn't really made for lounging or sunbathing, however. 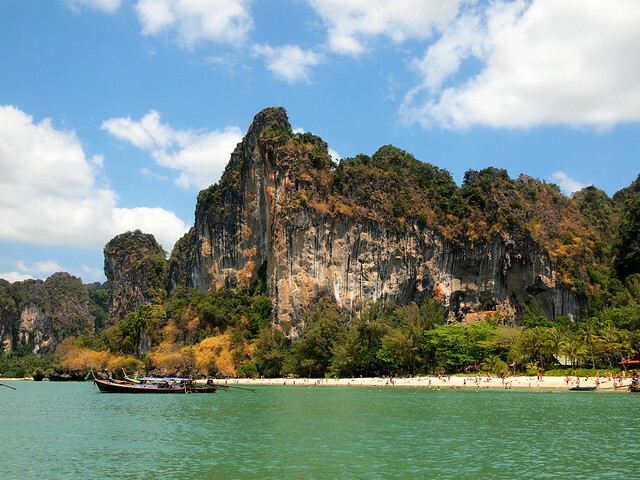 It IS popular with rock climbers, though, and is also the beach you'll be dropped off at if you take a longtail boat to Railay from Krabi town. Finally. We've reached THE beach. It's not far from the other (beautiful) beaches on the peninsula, but there's no denying that this beach is indeed slightly better-looking than the others. 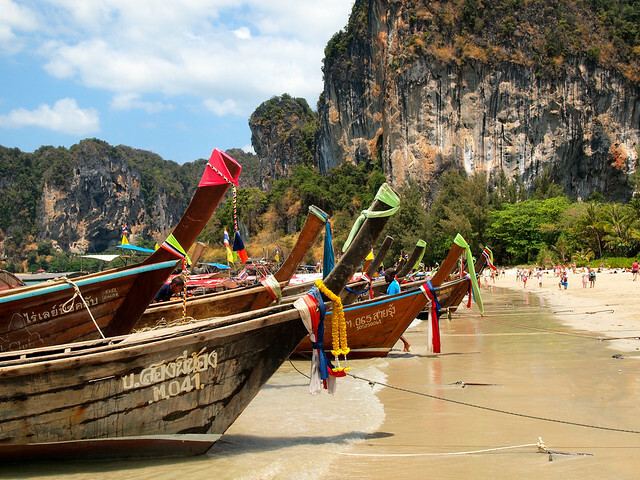 With nearly white sand, turquoise water, and limestone cliffs rising up out of the sea, Phra Nang sure is a looker. And it's got character, too. Here, instead of sandy-floored restaurants, you can order snacks and beer from longtail boats floating in the clear water. 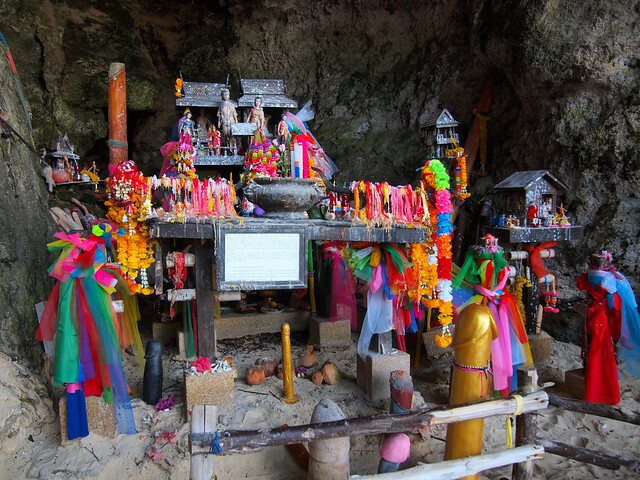 You can also visit the Phra Nang Shrine inside the “Princess Cave.” This cave, dedicated to the spirit of the drowned princess, is unique because fishermen leave quite… interesting offerings here. Pranang Beach is the beach that is often dubbed the “most beautiful beach in Thailand,” and appears on various lists naming the best beaches in the world. Like I said, I haven't been to every beach in Thailand, let alone in the world. But I can't deny that this beach IS, in fact, quite beautiful. So what do you think? Are these some of the most beautiful beaches YOU'VE seen? Wow, Cave Beach looks amazing. So dreamy! The blue water makes me want to swim until the end of time. The rocks along the beach make it even more magical. Beautiful photos. It definitely was a beautiful beach! The water was SO clear and SO turquoise. Picture perfect postcard beach. Great photos Amanda. I loved spending time at the beach in Thailand (Koh Samui and Koh Tao in particular) but they weren’t the most beautiful beaches I’ve ever seen. I found many of the beaches to be covered in trash, which was a bit disheartening. I have been to Thailand a few times and must go and see Pranang (Phra Nang) Cave Beach next time. Yes you definitely should! My tip, though, is to go earlier in the morning – less people there before lunchtime! these pictures are so beautiful that look almost not real! you make me want to visit SE Asia more and more! Well, to be honest… I think it’s impossible to put a finger on “the best” or “the most beautiful” – because both are subjective terms. Even though I find white sand beaches beautiful, I, for instance – think black sand can be just as great. There are q lot of cliches in the whole “the best” or “the most xxxxx” – and most of the time, it’s more of a marketing trick than anything else. How often have you read “the best” and them you went there and realized it wasn’t so good at all? I definitely agree, Katharina! I even pointed that out at the beginning of this post. Though I do definitely think this is one of the prettiest beaches I’ve seen! You are so right, everyone’s definition of most beautiful is different! It sure does look like a beautiful beach, but if everyone keeps saying that it’ll be covered with tourists soon. Many years ago when I first went to Fuerteventura, we stayed in a hotel 2kms away from the town, riiiight on the beach. The sand was as white as can be, the sea was as turquoise as can be- no photoshopping needed. And it was huuuuge, and I always thought you’d never need to worry about getting a spot on that beach. Now, 15 years later, it’s packed. Buses drop tourists off from the closest town- for those who can bare the brave public transport! It is still beautiful, but it’s part of a national park and all the extra buses going that way have made the local council consider closing the road because of the damage it’s doing. Yeah, I know exactly what you mean. 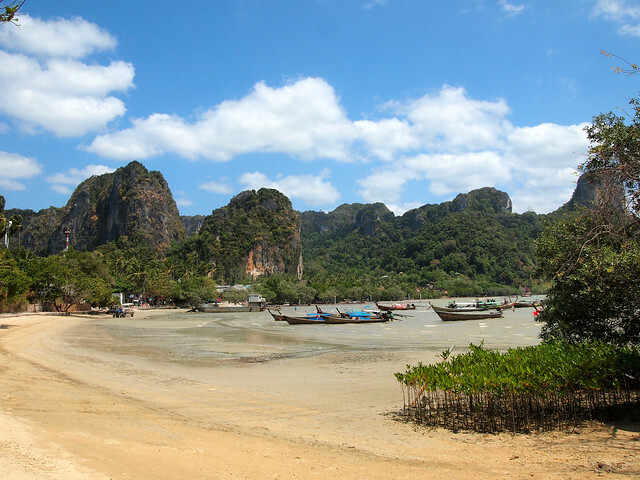 And, in fact, later in the afternoon, these Railay beaches DO get fairly crowded. I guess that’s just the price of popularity, eh? Yes, those are the most beauiful beaches I’ve ever seen, even through my computer! As always, your photos are gorgeous. Thanks for sharing, Amanda! Thanks, Lauren! Not difficult to take good photos here, though! All of these beaches look amazing, but I agree that Phra Nang is the most beautiful, and it doesn’t even look that crowded! I went in the morning (around 11 or so), so yes, it was fairly empty! It started getting more crowded around lunchtime, though. Stunning! I’ve never been to Thailand, so I can’t comment on whether or not this is the most beautiful beach – but views like this are certainly part of the reason that Thailand is on my wish-list! All the photos I’ve seen of Whitehaven look incredible – it’s on MY bucket list! Even if you were to claim this as the most beautiful beach in the world, I wouldn’t have argued. It’s got to be right up there! Wow, Phra Nang is a beautiful beach!! It’s got everything I love… white sands, clear waters, limestone rocks, and caves! Your pictures are seriously making me earn for some beach life! I wish I could be back there right now! Wow, absolutely beautiful. Your pictures are a great reminder of how big the world is and how much stunning scenery is found in it. While I love experiencing culture and history when traveling, I’m not going to lie…the beach life is just as tempting, especially these gorgeous Thai beaches. P.S. Loved that fertility cave picture! Never a bad thing to schedule in some beach time. Especially when in Thailand! Wow, those beaches are absolutely beautiful! I feel like it’s so difficult to decide what the most beautiful beach is in any country, I couldn’t imagine trying to decide in Thailand! I can’t wait to visit one day! 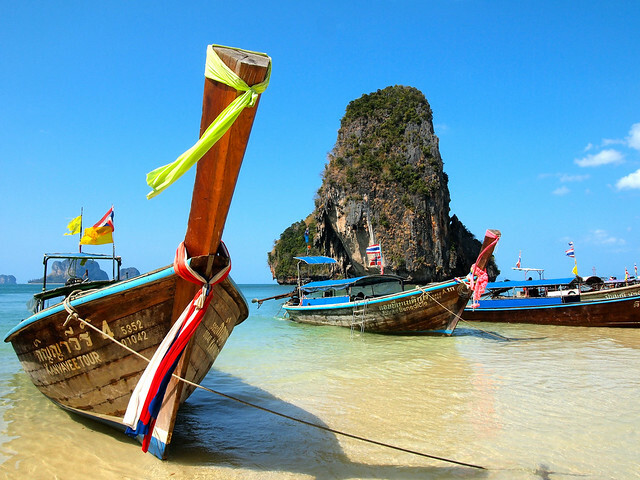 Thailand has quite a few beaches that could easily win the distinction! Railay beach is nice but can be really busy. My tip for a more beautiful beach in Thailand, without a lot of people, would be stay overnight at the similan islands. However for the most beautiful beach in the world title I would consider some country other then thailand. Like Mexico or Tanzania. I’ve heard good things about the Similan Islands – would love to go there someday, too! I really need to travel more in Mexico! So many great beaches there, too, I’m told. I’ve been to quite a few beaches in Thailand (and Southeast Asia in general!) and I always name this as one of the most beautiful among them 🙂 She’s a stunner! Glad to hear you agree, Alex! It is pretty beautiful but I haven’t been YET =D I’ll let you know when we make it around those parts! Sounds good! At the very least, it’s definitely worth a visit. There are so many beautiful beaches in thailand and one of the best is Koh Samui island, have the chance to stay at Crystal Bay Beach resort at Koh Samui experienced the perfect white sand beach. Koh Samui is definitely on my list!! Phra Nang is definitely a cut above Railay West and (the barely a beach) Railay East. Gorgeous limestone caves which remind me of the Phang Nga Bay (where they shot James Bond movie). But for me, my favorite beach in Thailand is still Hong Island. It’s huge, bluer than blue, full of huge cliffs and relatively less crowded as compared to other beaches along the Andaman coast. Good tip! I’ll have to check it out next time I’m in Thailand! As a regular reader of your blog ( 🙂 ) and as a Thai, I thought I would jump over to your Thailand section and see what’s happening. And Phra Nang/Railay is often packaged to visitors as the most beautiful in Thailand, but few Thais agree with this designation. 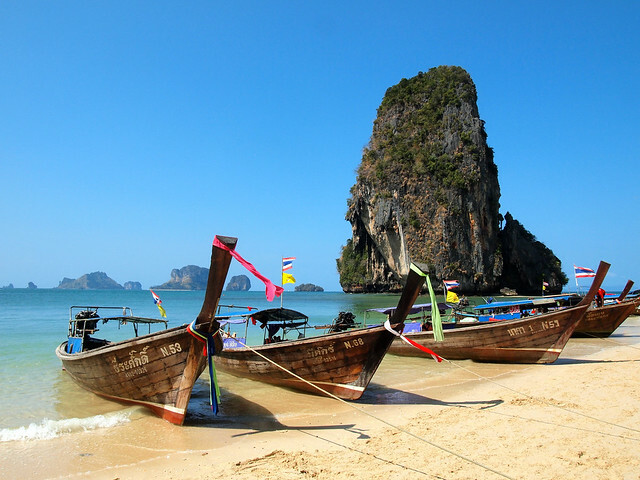 There are multiple beaches in Thai travel literature that are considered more beautiful and more appealing. I do like how you craft your post to take into account possible alternatives. If anyone is headed to Thailand, let me know and I would be happy to share those spots. We are headed to Thailand next month! 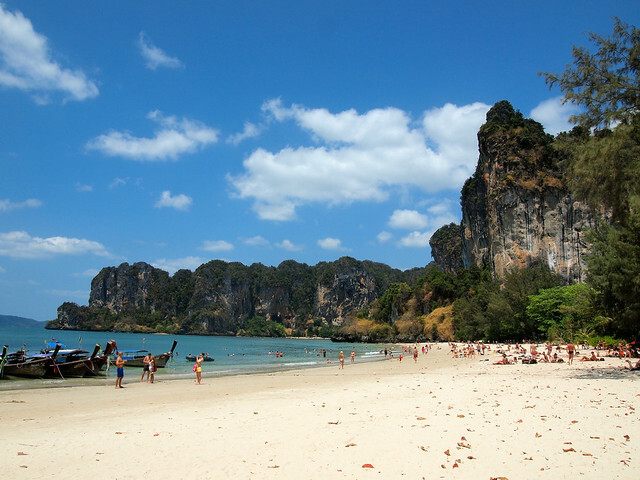 Where did you stay in Railay/ Pranang (Phra Nang) Cave Beach? I’m also having a similar problem trying to decide between the islands. 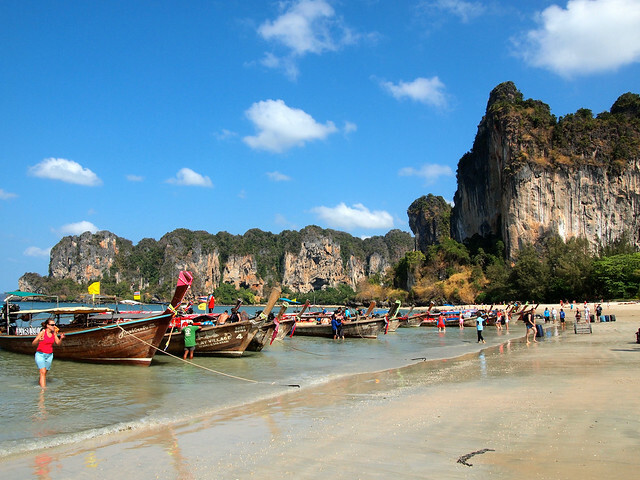 We are set on Phi Phi and Railay…. (I think, for today anyway… until I change my mind again) But it was a toss up with Koh Lanta… Any helpful thoughts? Hey Lauren! I actually didn’t stay in Railay at all (it was all way too far out of my budget by the time I got around to booking things). I stayed in Ao Nang instead and took the boat over to Railay for the day. I honestly don’t remember where I stayed, though, because it wasn’t that great. I also did a day trip to Phi Phi and a couple other islands from Ao Nang/Krabi. I stayed on Koh Lanta for a few nights, too, though, and LOVED it. It’s so much more chilled out, which is exactly what I was looking for for the end of my trip. Thanks, Amanda! Your Thailand posts have been a great planning guide for our trip! Very nice post. Railay beach is definitely one of my favourite beaches. I think the cliff does make my visit became more interesting than other beaches. Another beach that I would recommend it Surin Beach, a beach that is located between Bang Tao and Kamala beach. It is such a peaceful and relaxing beach to visit. Also, there are many excellent accommodation around this area.